Will be shipped in one roll 300 x 10000 mm. You will need developer - buy it here. 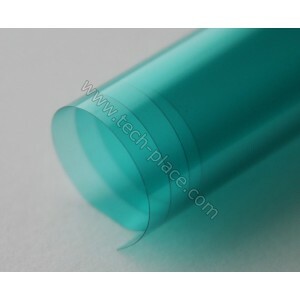 1) Cut photosensitive film and peel away a protective foil from one side of the film. A) Carefully apply resist by your hands. Try to avoid air bubbles. Once you are done, use an iron heated to 105 °C, put a sheet of paper on the resist and apply the hot iron. 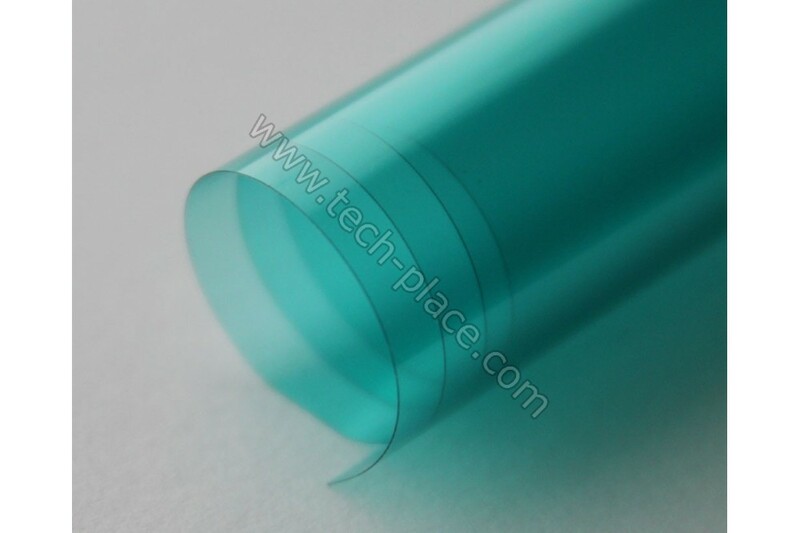 B) Although this is dry film, you can apply it by wet lamination. Wet entire surface of your pcb, then apply photoresist. Carefully push water or air bubles out by using soft cloth. When all water and air bubbles are out of the board, feed the board into hot roll laminator. 3) Expose it. By using a knife peel away the top protective layer. Don't damage the photoresist - if you see you are damaging it try to peel away the protective layer from other side of the board. Put your negative artwork (black areas will be etched) on the photosensitive film, place a sheet of transparent glass or plastic on it. Expose it using UV ligh source. Keep the temperature of the board low (40°C max) during exposure. Exposure time depends on your UV light source type and the distance between UV light source and the board. Properly exposed photoresist will be much darker after exposure. 4) Develop the photoresist using 1% Na2CO3 (sodium carbonate) water solution. Put the exposed board in the developer and wait for 3 minutes. You can heat the developer to 30 °C to speed up the process. Once you see the board is completely developed, rinse the board in water. 5) Etch by ferric chloride or HCl + peroxide, than wash the board. 6) The last step is to strip the rest of photoresist away. Mix 50 g of sodium hydroxide (NaOH) with 1 L of water. Wait till all the photoresist is stripped. Wash your board and it is done. Store the film in a completely dark place and at temperature below 20 °C. When working with the film be at a dark room.